More and more, supermarkets are significantly investing in lower-income neighborhoods. This store, located at 503 West Side Ave in the West Side neighborhood of Jersey City, is a perfect example. Unfortunately, this is what the store looked like as recently as 2013, as we see in this Google Maps street view. At the time it was owned by Frank Siam. But by the time 2015 came around, new management came in, gutted the building, and opened up a brand-new Bravo Supermarket in the same space. Unlike many supermarkets in neighborhoods like this, especially in super-popular Jersey City, and like the Met before it, Bravo features a small private parking lot next to the store. 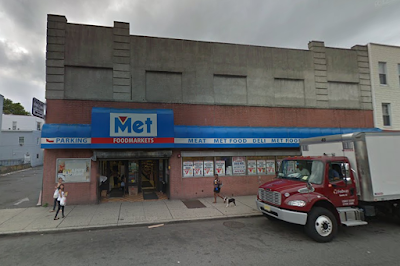 The renovation was possibly due to the news that the long-abandoned Fine Fare Supermarket about 3/4 of a mile north at 759 West Side Ave was to be reopened as a completely new Fine Fare. Wondering what Fine Fare looks like? You're in luck! We'll check it out on Friday.